Elish Consulting expertise in developing Mobile Applications across a variety of platforms and devices. 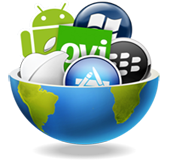 Our experience includes iPhone Mobile Application Development, iPad Mobile Development, Symbian Mobile Application Development and Android Mobile Application Development. According to many several surveys, by year end 2013, more browsers will use their smart phones to access websites than the desk top. Thanks to the revolution in mobile phone – namely smart phones – an increasing number of people now turn to their mobile as the first choice for browsing. This is especially true of the younger generation. Now-a-days, majority of people are drawn towards mobiles for internet surfing. Consequently, a mobile compatible site becomes a very curtail part of the marketing strategies for online businesses. Desolately, 70% of the websites are not mobile compatible and online users persistently facing difficulties associated with accessibility and usability. Hence, it becomes important for the website owners to get a mobile version for their websites. Electronic publishing is the process of creating the digital products and electronic articles, and the development of digital libraries. Electronic Publishing is the future of publishing it is also a part of immediate diversity of reality. The main reasons that people love electronic publication to access shear ability, portability etc.Our Electronic Publishing gives a special challenges, and we need to import your products to market promptly.The advantages of e publishing are the cost saving in printing and paper as well as better data storage and maintenance.Mobile application team develop the newest transpose in mobile technology , they have a good knowledge in mobile development services. Mobiles and their app are interesting trends that have m-commerce and relevant commercial enterprises looking into. B2C enterprises or business to consumer service and product companies in the information technology and other industry verticals cater to web development and mobile app design. Companies of B2C enterprises concern for online auctions, career orientation and development, app distribution and design for mobile like Blackberry, Nokia etc are now the latest trendy design apps.